Light breezes are again the prospect for the Mahurangi Regatta. Nice for the picnickers, and dancers in the evening, but not what most of the sailors crave. Unfortunately, what is also a little light, so far, is the response of Mahurangi West residents to volunteer to help with the tradition beach events. Not so at Scotts Landing. The Mahurangi East Residents and Ratepayers Association has formally stepped up this year to fulfil most of the numerous duties involved with the Mahurangi Regatta prize giving and dance. Until now, because that tiger was first grabbed by a Mahurangi West resident who knew better, the logistics of organising that part of the Mahurangi Regatta from the wrong, west side of the harbour were fraught. A seemly trivial example is that the wonderful folk from Warkworth Events and Party Hire, after erecting the marquee, omitted to mitigate the hazardous hammered tops of the steel pegs. This has been a perennial concern, all to often addressed at the last minute with a mile of gaffer tape laboriously wrapped around god-knows-how-many pegs. A more assertive, or angrier, organiser might demand the contractor make good. But when one of the reasons that the event is even possible is that so many do so much for free, or for less than they admit to their accountants, the reasonable response is to ask someone already travelling that way in today’s hellish traffic, to swing by Woodcocks Road and collect the bucket of adapted tennis balls and run them down to Scott Homestead, and around pegs. 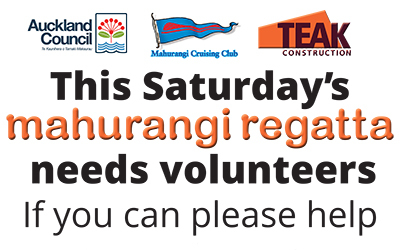 This Saturday’s Mahurangi Regatta needs volunteers. If you can please help, see you Saturday in the park. The actual sign, of course, is not cluttered with commas, and, if more could be conveyed effectively from a roadside side, it might have said, if possible, muster at 10 am at the announcer’s stage on the beach. But if you are only available after lunch, that would be great and reduce the chances that the morning volunteers need to do much more than a couple of hours. 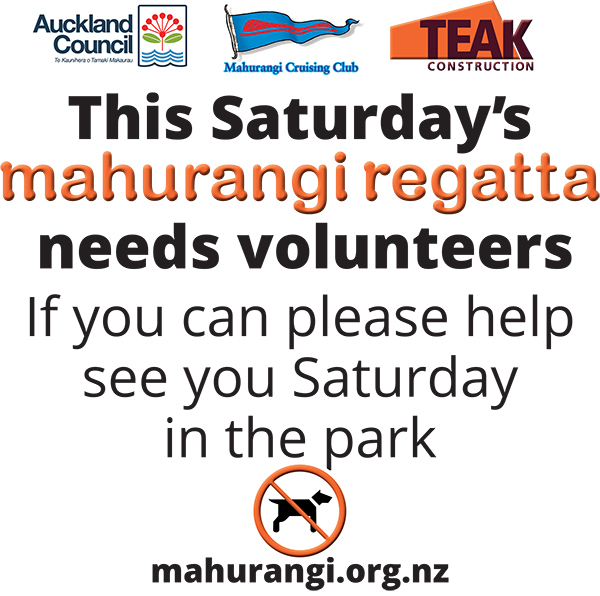 In the expectation that anybody who is considering responding, who doesn’t already know who to call for further information will google and land on the Mahurangi Magazine regatta programme, only the increasingly superfluous mahurangi.org.nz url made it onto the sign. Not only can community events such as the Mahurangi Regatta not function without volunteers, those who do, have the most fun. Saturday, in the regional park. Good morning, I can pick up the tennis balls from Woodcocks If this helps? I am due to have lunch with a friend on Mahu East Peninsula 11:30-12. If you catch me by 11 am I’ll do it.